Whether you want to build a custom Wordpress theme, a custom Perch theme, a simple static site, or you just need minor edits to a theme that you've already bought, we can work out a solution that meets your needs. Being a tiny studio gives us flexibility. That flexibility allows to tailor solutions specifically for you so we have the ability to match your budgetary, time, and any other requirements you might have. It's really important that your site functions on all types of screen sizes - so responsive development is an area that we spend a lot of time on. We focus on getting the right content on the right screens for your users. Helena Duggan is a graphic designer, illustrator and children’s writer from Kilkenny, Ireland. I've worked with Helena on a number of projects, and also did some updates on her previous iteration of her personal site. So we worked together to develop the site based on another great design by Helena. The site is a bespoke wordpress theme built around how Helena wanted to add and edit content. 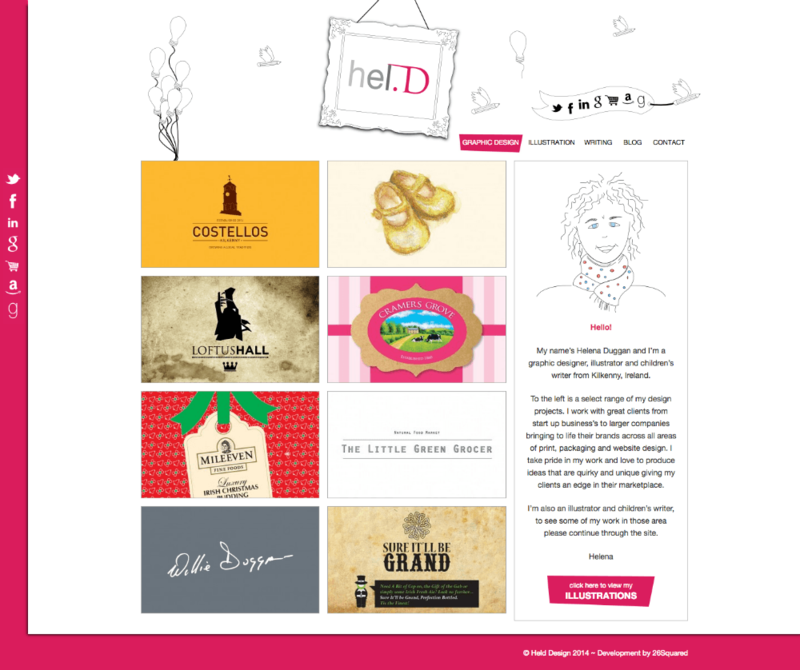 Helena's designs always have some great touches so I was delighted to turn the design into a custom wordpress theme. Bit cheeky putting this one up there as its my personal site. When I needed to update it so that I'd have somewhere to write I didn't want to use wordpress again. So I decided to use Jekyll for ability to build nice flat html sites. Also, when with a content first approach to the site, where the writing was the most important thing about it. I've kept the code to an absolute minimum, focusing on keeping it working across all platforms as quickly as possible. I also used grunt for the first time to do a lot of the leg work around the development of the site. I use this site as my test bed for a lot of my testing work so it rarely looks the same for very long! 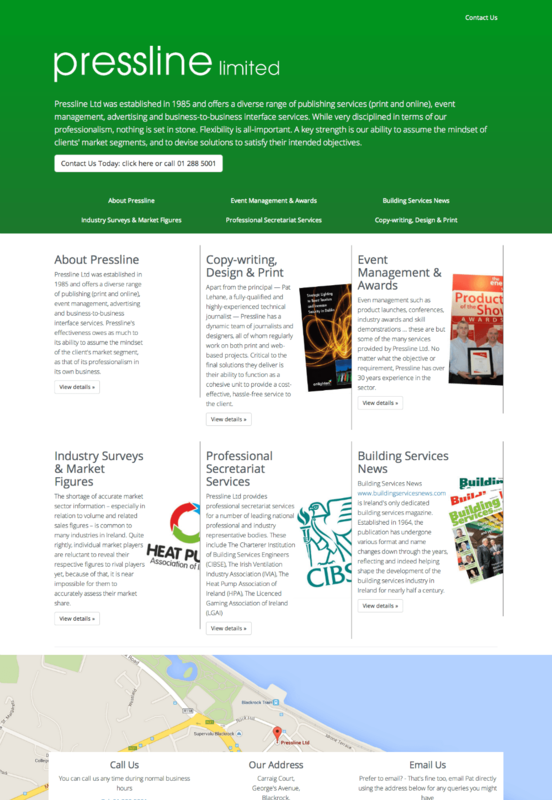 I've done quite a bit of work for Pat Lehane, Managing Director, of Pressline over the years. So he came to me when he wanted to redesign and redevelop his very old site to a more visually and technologically friendly website. We developed an easy to modify site built on Wordpress. 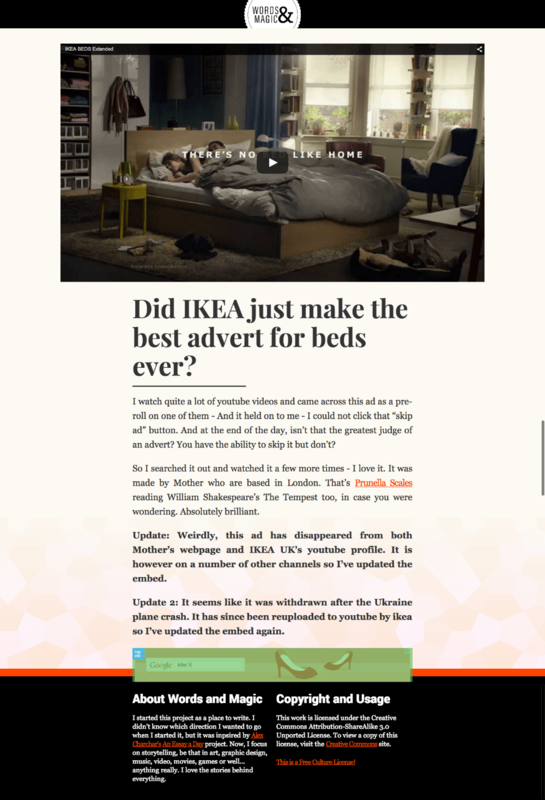 The site adapts to many screen size from mobile upwards. The site was built with a focus on ease of use, and a goal of being really easy to read. Everything is available quickly from the front page, links to all the services that Pressline provide and contact information with a clear call to action. I always stress the need to continually revise and work on things that work and don't work so Pat and I work regularly on edits that either he can make to the content or I can make to the underlying template. 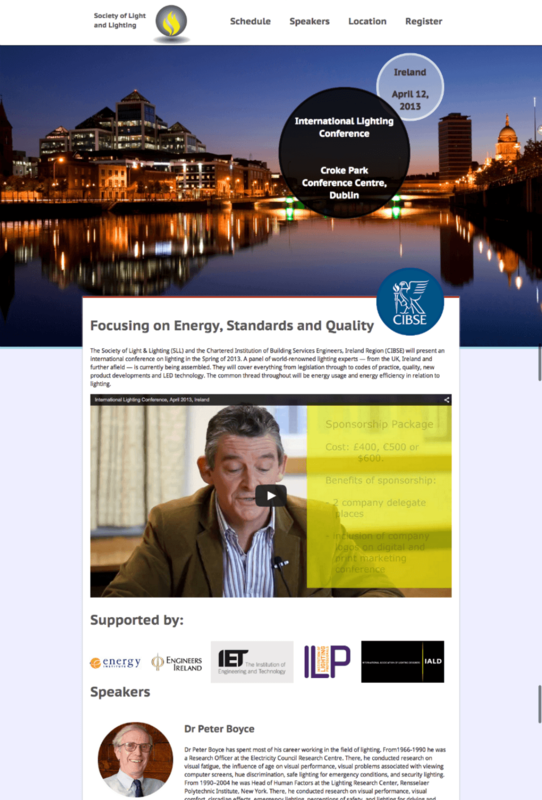 CIBSE is the professional body that exists to "support the science, art and practice of building services engineering..."
We developed this site on a bespoke wordpress theme, so that CIBSE Ireland could announce upcoming events, news items, and then share photographs and documents after their events and meetings to all of their members and interested parties. Wordpress was the perfect choice for this site, and I was able to use a number of very helpful plugins for event calendars and galleries. 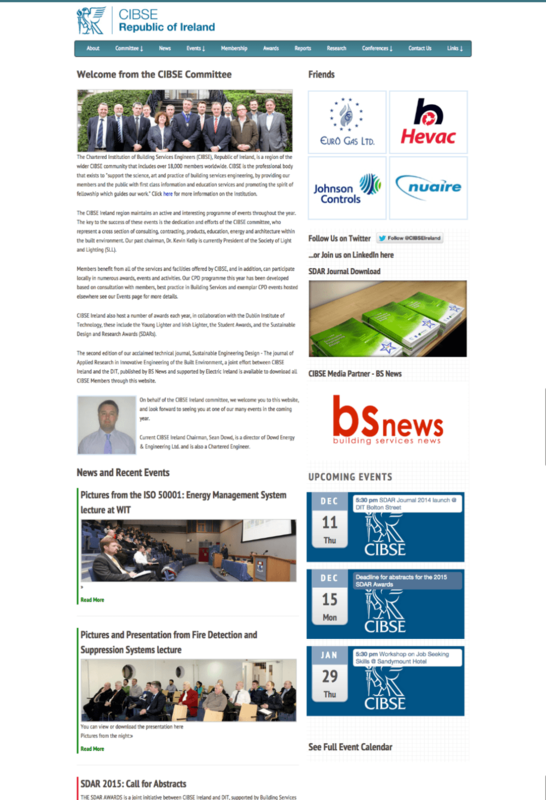 In 2013, the SLL and CIBSE held a joint annual Technical Symposium. After discussing it with the SLL representatives on the CIBSE committee, we decided to build an event specific landing page. We used Eventbrite to enable those wishing to attend to be able to pay online. The landing page gave all the details about the event in an easy to digest manner. Speakers, Locations, Topics, Timetable and then, we used eventbrite widgets to then display an easy ticket purchase option straight from the page. The live site is unfortunately no longer available. 26Squared is mostly, me, Dan O'Neill but depending on workload I work with a select number of excellent freelance designers and developers. In most cases, the content and images are mine. However, the icons I use in the services section above are a set of icons created for Smashing Magazine by Amie Andrews and the creative minds behind Whoishostingthis. That striking image from the contact me section is By Ales Krivec from Unsplash. I created the terminal at the top of the page in HTML and CSS, inspired by this article. The site perspectives were also created in css using this excellent code walkthrough.